Up at 8.30am and pack before having a cup of tea. We check out and then go down to the Tourist Information office to buy tickets for the ferry 23 kuna each for a single to Dubrovnik. The ferry arrives a bit late at 10.40am and just before we get on board the lady owner of the hotel rushes towards us and hands us our credit card. She had inadvertently left it in the credit card machine when we checked out and we hadnt noticed. We were obviously extremely grateful to her for rushing down to make sure we had it  the funny thing is I remembered that she had kept our passports and got them back but completely forgot the card. A gorgeous ferry ride  firstly stopping at Kolocep, which looks very pretty and then on to Dubrovnik where we get in around 11.45am. Go to the taxi rank and 90 kuna including tip to Villa Gloria. The taxi driver drops us on the road and we struggle with the cases up the 100 steps to Villa Gloria. 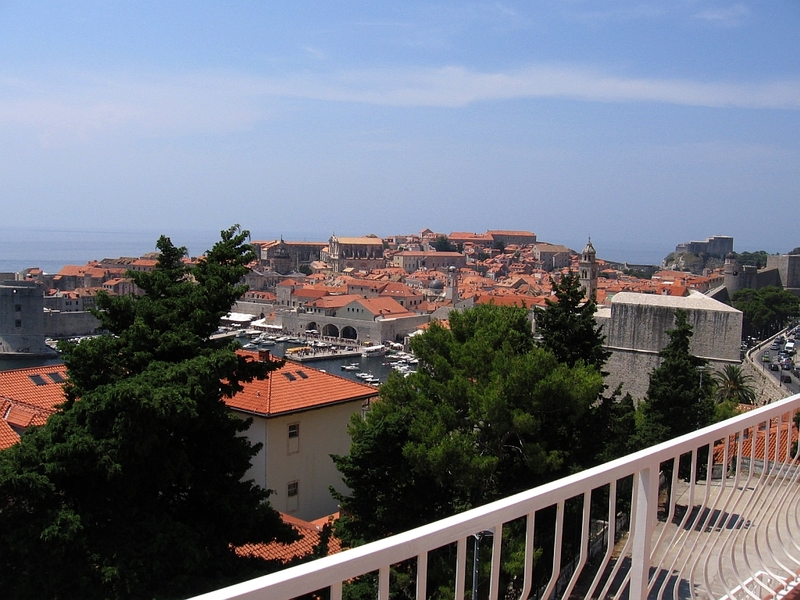 We have the attic apartment Orstat that has amazing views over Dubrovnik old town. 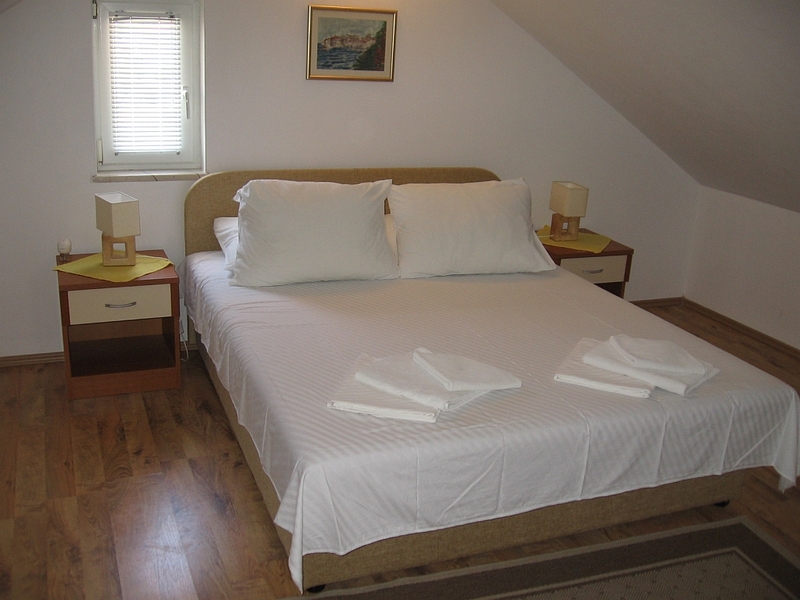 There is a double bedroom, bathroom with washing machine, sitting room/kitchen with a dining table. All leading out to a fantastic balcony equipped with a table, chairs and some sun umbrellas. We head out to explore and book Restaurant Dubrovnik for that evening and then go to Oliva Restaurant for Quattro pizza  smoked ham, mushroom, ham and cheese, and mozzarella and tomato salad and penne pomdora  with tomato and tuna, 2 beers, 2 orangina and lovely warm bread 300 kuna including tip. Wander back and chill in room before enjoying a rum and coke on the balcony enjoying the most amazing view. Out at 6.30pm to DVino Wine bar. The guy there is very knowledgeable and offers us advice on wines. Kev tries the flight of 3 Croatian white wines whilst I try the 3 Croatian reds, India just a glass of red and Georgia a soft drink. It was a great way to try different wine and we both had definite favourites. 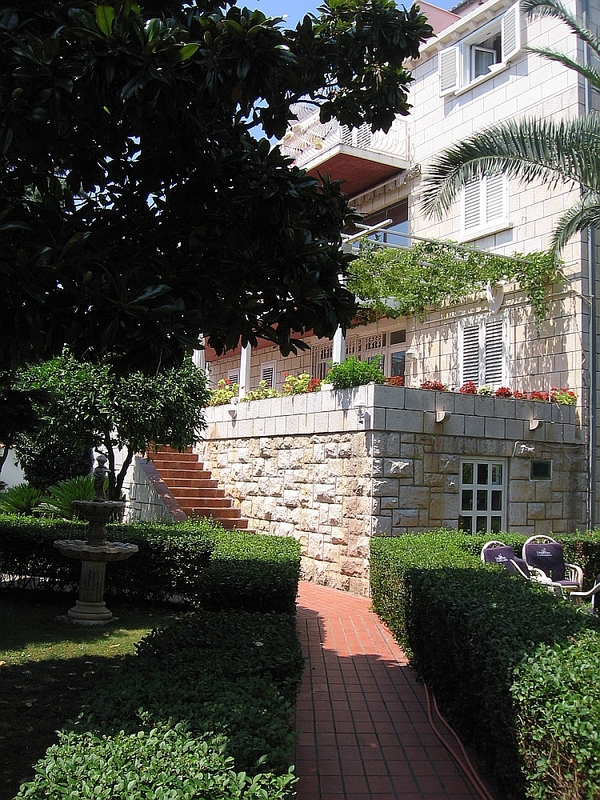 Wander along the bustling cobbled streets full of people to The Dubrovnik Restaurant. We go upstairs where the actual restaurant terrace is and we have a table on the edge of the terrace. The souk like tented ceiling and white chairs and tablecloths, together with the tinkling fountain add to the lovely atmosphere of the place. 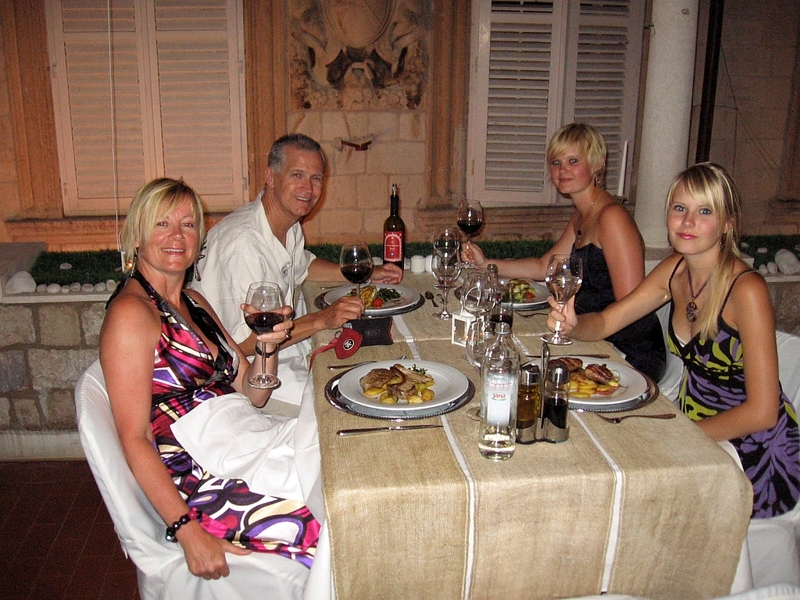 They have various menus to choose from with a variety of number of courses and fish or meat based. Kev and India go for the 180 kuna fish menu 5 courses, whilst I go for the 150 kuna meat menus and Georgia decides just to choose off the a la carte menu. We head out to have our first glimpse of Dubrovnik old town in the dark  it really was beautiful  all the amazing buildings and churches lit so well with strategically placed lights highlighting the amazing architectural details. It was really buzzing by now with people strolling, musicians playing instruments and singing, people eating on the pavement cafes and bars and we also came across an open air theatre where a play was being performed. We guessed that this was part of the Dubrovnik festival, which was being held whilst we were there. It was such a lovely atmosphere and our walk proved again just how many restaurants etc there are to choose from in this small walled city. Wander up towards the city walls to try and find the Buza bar that we enjoyed on our cruise some 2 years earlier  but end up in the more upmarket Buza bar  again wonderful views over the sea but it is absolutely heaving and there are no seats vacant so we leave and go the Exit Rock Café. Mai tai for me, mojito for India and margarita for Kev, Georgia coke. The cocktails are all pretty strong. There are people drinking 3 litres tubes and pumps of cocktail and beer, there is loud rock music too  not for everyone but it was a fun way to round off the evening. Bed at 12.30am when we eventually work out how to turn the settee into a bed for the girls.